Using tooth powder instead of the traditional paste is not a new concept. There are still people who use sodium bicarbonate from time to time to give their teeth a thorough cleaning. But there are a lot of powders, including sodium bicarbonate that can be too abrasive for daily use. This is where Primal Life comes in. 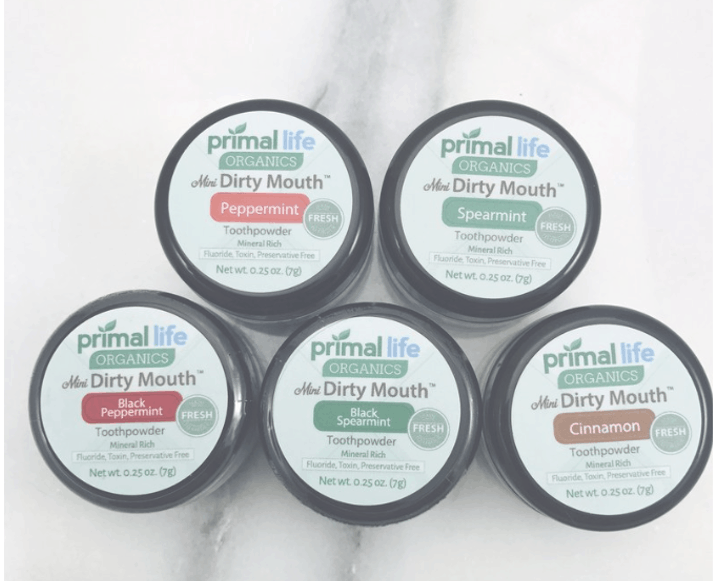 The Primal Life Dirty Mouth Tooth Powder is a new product that’s gentler than most products of its kind and has more of a toothpaste feel when brushing. It’s not entirely non-abrasive, which means it still gives a thorough cleaning. Because it’s easy to use and comes in various flavors and formulas, this Primal Life tooth powder is attracting a lot of attention. Of course, the cheeky name ‘Dirty Mouth’ also draws attention and makes people curious to see just how much confidence the manufacturer has in the product. The packaging is also a reason why this powder might just be a top choice and potentially a replacement for traditional tubes of toothpaste. It makes travelling with your favourite oral hygiene product less stressful. There’s no reason to worry about spills or not having enough room. Almost all tooth-cleaning products have a minty scent. While some are stronger than others, you can get bored quickly from using the same product over and over again. Even if you don’t, you may start to feel like it’s losing its potency. For a breath of fresh air, Primal Life came up with interesting natural flavors and squeezed as much as possible out of them. The cinnamon-flavoured powder alone is reason enough to give this product a try. Unlike most commercial oral hygiene products, you can really tell the difference between spearmint and peppermint, which is saying a lot. What’s even better is that you can switch flavors on a daily basis and keep things fresh. The Primal Life formula uses baking soda in lieu of the potentially unhealthy aluminium hydroxide. It also contains essential oils and three different earthen clays. The end result is an oral hygiene product with fewer synthetic detergents and more organic ingredients. The formula also tastes superior compared to most brands of toothpaste and tooth powder. As a cleansing agent, there’s nothing bad to say, even though some people may still be doubtful about going the organic route with cleaning products. A 0.25 oz. container of Primal Life tooth powder can last up to one month. Very little powder is needed to clean your teeth if you prep the brush accordingly before applying the powder. In most cases, covering just half the brush with powder should be enough. 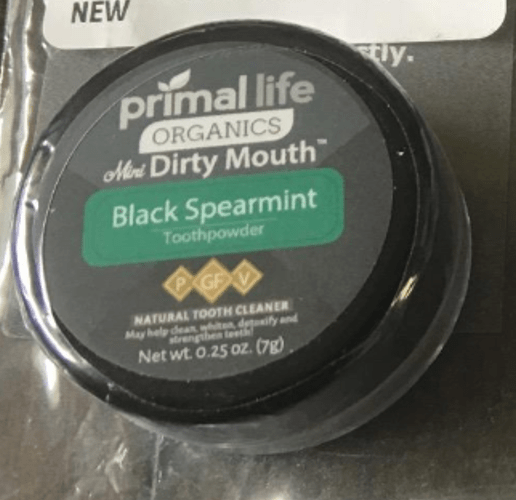 Most of the time, companies charge more for natural cleaning products but Primal Life seems to be the exception to the rule – not because they make a cheap powder but because it takes so little powder to make a good amount of paste for brushing. Using tooth powder instead of toothpaste changes the way you apply the product. While the motion remains the same once you start brushing, the steps for product application are reversed. Before you apply tooth powder to your brush, you need to lightly wet the brush. This is such that the powder can react with the water and moisten as soon as you put it on, making it ready to use. This also helps the powder stick to the bristles, as it doesn’t have the same consistency as toothpaste and can otherwise easily fall off the brush. There are also a few ways to apply the Primal Life Dirty Mouth Tooth Powder once the brush is wet. You can dip the brush in the container or put the powder in your hand for scooping up with the wet brush. However, it is recommended that you sprinkle the powder on the wet brush in order to avoid dipping it in the container and wetting too much of the powder. In terms of brushing, there’s no special technique or duration to keep in mind. Once you apply the powder to half or three-quarters of your brush, simply brush your teeth as you normally would for about 2 minutes. The Black Dirty Mouth Tooth Powder’s activated charcoal formula is the only one that’s effective at whitening teeth. Not all varieties of the Primal Life tooth powder have a component that helps with whitening. This is a bit disappointing given how much emphasis the manufacturer puts on this aspect of the formula. It’s also worth noting that the most cost-effective and interesting pack, the mini 5-pack, doesn’t include any good whitening properties. It seems that no matter how hard some manufacturers try, there’s just no escaping the curse of bad taste in natural hygiene products. Although the flavors are potent and you can really feel the spearmint, peppermint, or cinnamon for quite some time after brushing, the taste is not spectacular. In fact, if you compare the scent and taste, you might think they’re from two entirely different products. Is this really a deal-breaker? No, because there are plenty of health benefits that more than make up for bad taste. But if you do have sensitive taste buds, you might have a hard time using this powder over traditional toothpaste. What makes this powder unique is the fact that the formula is loaded with vital minerals and nutrients that your teeth need to stay healthy. The Kaolin Clay adds a healthy dose of calcium which helps with teeth strengthening, and some silica which helps the cleaning process. The French Green Clay has great absorption properties which help to remove toxic substances and oils from between teeth or gum. Last but not least, the Bentonite Clay acts as a mild abrasive while also helping with the detoxification of the gums. Although there are two types of earthen clay in the formula that have abrasive qualities, the powder is quite safe to use on recent dental work and even braces. Once the powder is wet, it turns into a paste. Therefore, it should feel exactly like toothpaste against your teeth and gums, yet less rugged due to the choice of ingredients. You should worry more about using the right toothbrush than about ruining your dental work when brushing with this tooth powder. There aren’t that many studies that compare tooth powder and toothpaste in terms of effectiveness. One of the reasons is the fact that tooth powder essentially turns into a paste after coming into contact with water. This means that only the ingredients are different, not the actual usage. 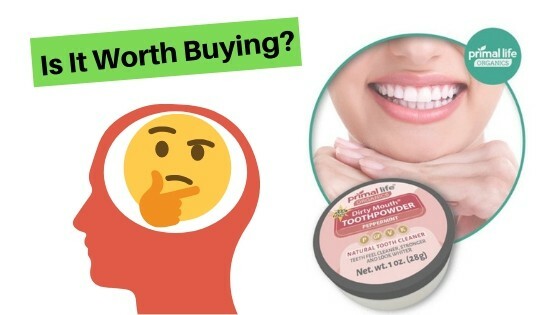 Some experts seem to believe that tooth powder may have a better chance of maintaining whiter teeth and even removing common stains that occur from smoking, drinking coffee, etc. As the two ingredients necessary for whitening are found in the Primal Life Organics formula, it’s no wonder that it shows great potential. What Do Customers Think About The Primal Life Tooth Powder? Most customers seem to be pleased with how the powder works and tastes. In terms of abrasiveness and cleaning quality, everyone appears satisfied. Users report healthy gums and teeth with long-term use, and successful stain removal too. Where some reviews are split is the taste. Almost all users agree that the scent is as natural and potent as it could be, but not everyone likes the taste the powder leaves in the mouth shortly after brushing and rinsing. Many users are particularly pleased about using a natural product instead of the traditional toothpaste that’s laden in synthetic chemicals. They are also pleased about the quality and seem to think that the Primal Life Dirty Mouth Tooth Powder is fairly priced. There are some customers who made a few comments regarding gums hurting after using for a while. However, it’s hard to have anything definitive to say about those reviews as there are many medical reasons that can explain why someone might not be able to reap the full benefits of the powder. As far as the packaging is concerned, the customers are happy, yet very few talk about the portability factor. This is perhaps an angle that matters more to the manufacturer than the actual customers who just want a healthy and natural product and don’t care about going places with it. As stated, most customer reviews are on Amazon. The Primal Life Organics website doesn’t have a dedicated section and only offers scarce testimonials here and there for some of their products. Finally, the tooth powder is compatible with electric toothbrushes. Many users of Oral-B and Philips electric toothbrushes have tried Primal Life tooth powders to great effects. The Primal Life Dirty Mouth Tooth Powder Mini 5-Pack is an excellent choice for first-time powder users. The pack comes with five flavors – black peppermint, spearmint, peppermint, black spearmint, and cinnamon. This allows you to get a feel for using the powder and experiment with the available flavors until you find something you like. This is also a very cost-effective option to try tooth powder. Each container holds 0.25 oz. of powder which is the same amount you get if you were to buy individual containers. The discount and flavor variety make this a nice starter pack. However, it’s worth mentioning that you can’t choose the flavors. If you order the pack, you get one of each five flavors and that’s it. Another interesting option is the Black Dirty Mouth Tooth Powder. This formula, as previously mentioned, has very good whitening properties because it combines activated charcoal and baking soda (sodium bicarbonate). If you’re looking to get rid of stains and save money on professional tooth cleaning, it’s not a bad alternative to the starter pack. What isn’t as appealing is the dental starter kit. While the single container of powder, lip balm, and gum serum are great, the toothbrush is fancier than it is ideal. Although this is a rather new product, the powder is not hard to come by. You can easily find it on Amazon and order any flavor, size, or quantity. There are only two available sizes – 0.25 oz. and 1 oz. The product can also be ordered through the Primal Life Organics website if you prefer getting it straight from the source. One thing to note is that Amazon doesn’t seem to always have the 5-pack in stock. But it does have the full dental package and other offers as found on the Primal Life Organics website. As you might expect, the prices are good on Amazon and you might also find discounts that you can apply to future purchases. However, if you want to set up automatic delivery where you get your powder once a month or every two months, it is easier to do this on the Primal Life Organics website. Still, if you want to buy this powder and also check out lots of user reviews, you’d have to do so on Amazon. The manufacturer’s website doesn’t have too many testimonials, nor does it feature any bad reviews that you might want to take into account. 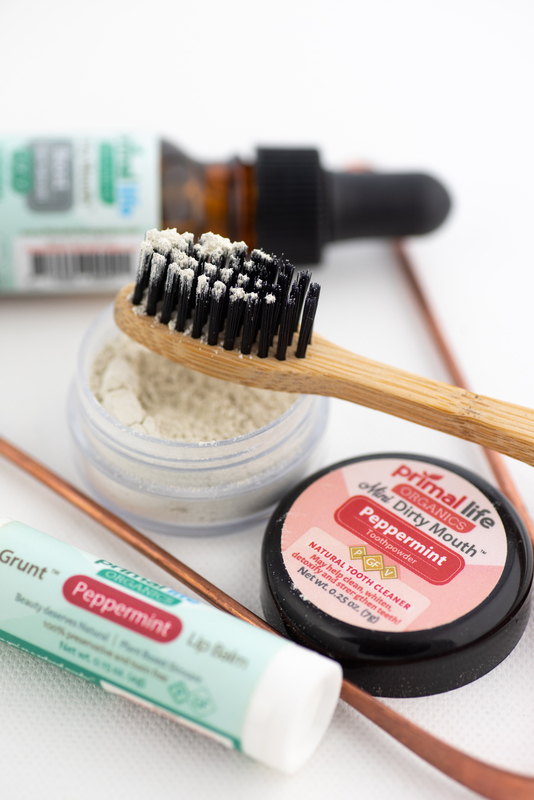 The Primal Life Dirty Mouth Tooth Powder is a wonderful alternative to classic toothpaste. It’s like buying a concentrated form of toothpaste, as the powder turns into a paste upon contact with water and the feel against the teeth and gum is roughly the same. In addition, there are qualities that may make it a better oral hygiene product. Unlike other options, this powder contains only natural ingredients. It combines various clay’s, baking soda, and sometimes activated charcoal (for that extra shine). The natural formula doesn’t contain any fluoride, which is a good thing if you’re already dealing with excess fluoride in your tap water. The powder form is cost-effective, at least as far as natural products are concerned. Using it is just as easy with a manual or electric brush, and the less-abrasive nature of the product makes it safe to use on sensitive areas. The powder basically offers everything a natural product should. Even if not all customers can agree on the taste. At least the scent keeps your mouth fresh for quite some time after brushing and it’s both natural and potent. Hi! Thank you for writing about this alternative. And because it has only natural ingredients, to me it seems great to replace classical toothpaste with Primal Life Dirty Mouth Tooth Powder. I also like it’s cost-effective. I would like to buy the 5-pack. Although you have mentioned Amazon not always has it in stock, I really hope I can take advantage of this deal. I’ll check right now. But if they don’t have the 5-pack in stock right now, do you have any idea how long could I wait for them to have it again? Thank you very much! You had me at the fact it contains zero fluorides. I’m no fan of fluoride in any way and it’s one reason I’ll only drink bottled or filtered water and limit my fluoride intake to toothpaste only and I wouldn’t mind getting rid of it. I’ve been long searching for toothpaste that doesn’t contain fluoride and am actually in the process of ridding potentially hazardous ingredients in all toothpastes, shower gels, hair gels, and even household cleaning products. For me, the more natural the better, and definitely the healthier. I’m glad we live in an era where products like these are readily available on the market. Going back to natural remedies like our ancestors used will do us a world of good. It’s a massive boom but be careful as some products are not really good even though they claim to be natural. Often times they are just filled with useless ingredients that don’t do anything. Always do thorough research and read the ingredients carefully. Were there any side effects or irritation when using this tooth powder?